Bengaluru: Over 60% of complaints lodged at the Karnataka State Women’s Commission are about harassment of women via social media, according to the commission’s chairperson Nagalakshmi Bai. This trend may not be confined to Karnataka, she said. Bai made the statement while speaking to textile workers at a factory in Mysuru recently. She said the commission had to rely on the cybercrime division of the police to investigate the complaints, and the resolution of the cases took a long time. Hence, Bai urged DGP Neelamani Raju to set up a separate cybercrime cell within the commission to deal with such cases. According to the monthly crime statistics compiled by the Karnataka state police, in December 2018, 26 cases of cybercrimes against women were reported at cybercrime police stations in the state and 96 in the entire year. Chairperson for the National Commission for Women Rekha Sharma said the National Commission, too, received a lot of complaints of such nature, and they were increasing by the day as more and more people had started using social media platforms. “We usually forward such complaints to the police. Sometimes, if needed, we contact the social media organisation concerned and ask them to take down objectionable pictures the perpetrator would have uploaded on the platform,” she said. Sharma said more such cases were likely to be received from cities with a higher population of cyber-literate people. “So the Karnataka chairperson is probably right as Bengaluru is the IT hub of the country. Cities like Hyderabad and Gurugram are also expected to record many such cases,” she said. She said commonly reported case included those on stalking, uploading objectionable pictures on social media and hacking into accounts. “A very common situation is of a woman’s former boyfriend uploading private pictures of the woman,” she said. As per reports, the Rachakonda Commissionerate — one of the three police commissionerates in Hyderabad — has recorded a sudden rise in such complaints. Eight complaints of social media harassment and cyberstalking have been lodged in 23 days in January. In 2018, 24 cases of social media harassment were lodged. 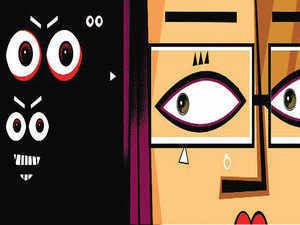 In October 2018, media reports threw light on a case in Bengaluru, which showed the extent to which a woman could get harassed and even blackmailed via social media. A 22-year-old HR personnel was allegedly sexually harassed and blackmailed for several weeks by an unknown person via a chat messenger platform. The woman kept blocking the sender’s numbers but would continue to receive messages from different numbers. The sender also sent messages to the victim’s family, in which the woman’s character was defamed. The woman lodged a police complaint, but no action was taken, the reports said.